I’ve seen and reviewed a couple of plays and other events since last week and I have a few opinions I want to get off my mind. You won’t be hearing from me for a couple of weeks because I’m going to a very exciting writers’ program. I’ll tell you all about it when I get back. A gripping political play by Ariel Dorfman, set in a country “that is probably Chile,” in the time after the regime of dictator Augusto Pinochet. See my brief review on Gapers Block, which links to my original detailed version on theandygram.com. 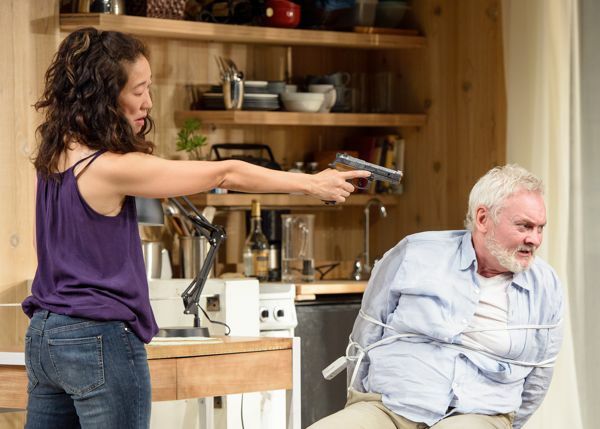 Death and the Maiden, starring Sandra Oh in a strong and nuanced performance, runs thru July 20 at Victory Gardens Biograph Theatre, 2433 N Lincoln Ave. I tweeted a link to my review on Gapers Block, with this comment: “You think your family is obnoxious? See what a Sam Shepard family is like.” A very good production of a play that is not for the faint of heart. The Artistic Home cast is talented and the acting solid. Their productions are reliably so. The Late Henry Moss by Sam Shepard runs until August 3 at the Artistic Home, 1376 W Grand Ave. This play, now closed, got excellent reviews. The two lead performers give fine performances and are also solid at their respective talents: music and basketball. The father, a violinist, doesn’t understand his daughter’s obsession with basketball. The daughter, a basketball player, doesn’t understand why her father thinks music is the only thing that matters in life. The conversation and interplay is entertaining, but the plot doesn’t hang together. At the end of the 80-minute play, I thought, well, ok, did I just waste an evening or what? If I had been reviewing this play, I would have given it two stars or “somewhat recommended,” as several reviewers did. And others gave it three or four stars. Chinatown. A movie review, for your home viewing. 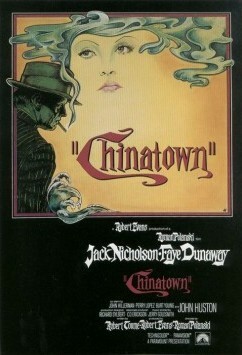 Have you seen Roman Polanski’s Chinatown in the 40 years since you first saw it in a movie theater? This 1974 film is absolutely brilliant. Every single detail–of clothing, behavior, autos, and clues to the mystery–is perfect and perfectly positioned. And of course, superb performances by Jack Nicholson, Faye Dunaway and John Huston make it as astonishing film. I liked it when I first saw it, but in recent years, I’ve learned a lot about filmmaking and directing (thank you, Roger Ebert!) and I was able to get even more out of it. Chinatown is available streaming on Netflix or, of course, on DVD. Next time you’re looking for a great movie to watch, choose this one!